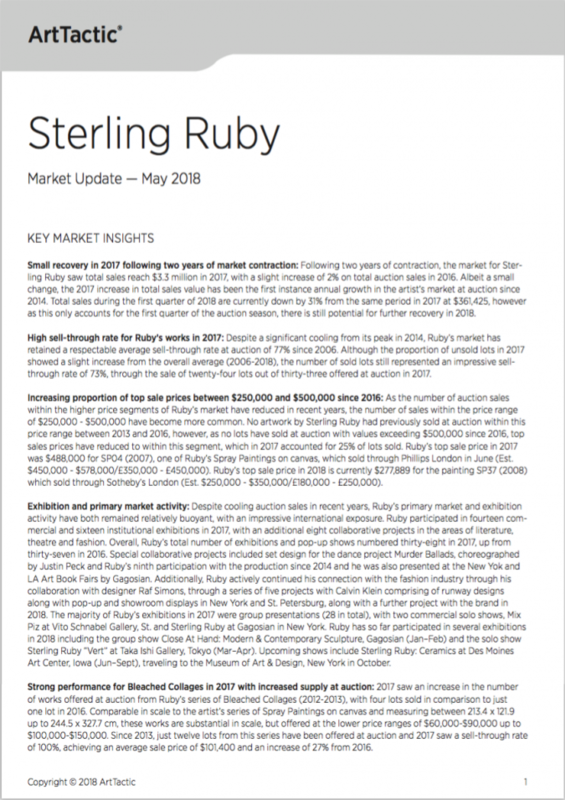 Small recovery in 2017 following two years of market contraction: Following two years of contraction, the market for Sterling Ruby saw total sales reach $3.3 million in 2017, with a slight increase of 2% on total auction sales in 2016. High sell-through rate for Ruby’s works in 2017: Despite a significant cooling from its peak in 2014, Ruby’s market has retained a respectable average sell-through rate at auction of 77% since 2006. Exhibition and primary market activity: Despite cooling auction sales in recent years, Ruby’s primary market and exhibition activity have both remained relatively buoyant, with an impressive international exposure. Ruby participated in fourteen commercial and sixteen institutional exhibitions in 2017, with an additional eight collaborative projects in the areas of literature, theatre and fashion. This Market Update follows on the Ruby Sterling Market Report published by ArtTactic in May 2017.